As with any action, they are very easy to operate/run. You simply highlight the action you want to run and click the play button. The result is a layer added on top of the background image where you either control the intensity of the action by the opacity or brush on the effects (depends on the action). As you can see there’s a significant saturation increase on the image. 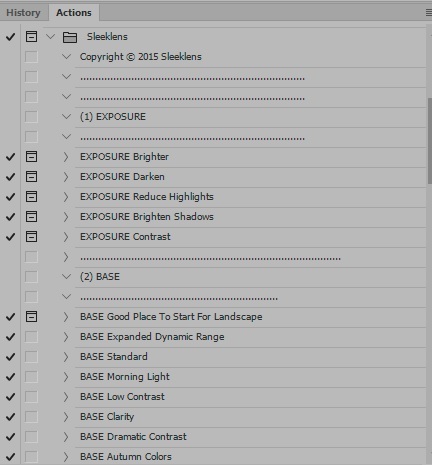 Posted in Reviews and tagged Landscape photo processing, Photoshop Actions, Reviews, Sleeklens, Software editing on July 6, 2016 December 5, 2017 by Tad Bowman. 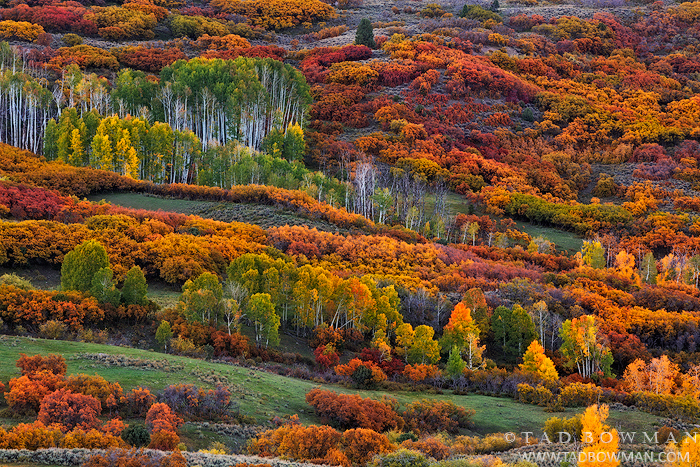 Following the same theme as the wildflower season, fall in Colorado was much different than years past. This year was a bit of a disappointment. The colors were around 2 weeks behind. A lot of trees that did turn were a muted color and then the snow and cold temperatures turned promising leaves into a rust or brown color quickly. However, just like the old saying, you must turn lemons into lemonade or make the best of the situation you are in. After all, when isn’t it nice to be out in nature? The following were my favorite images from this years outing. 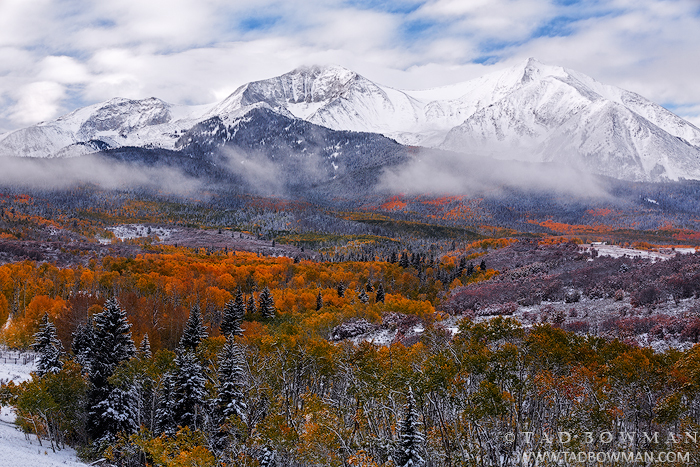 This image portrays early morning with Mount Sopris enshrouded in clouds after an evening of snow with orange aspen trees lining the foreground. I love this peak. It dominates the landscape and find myself photographing it often. 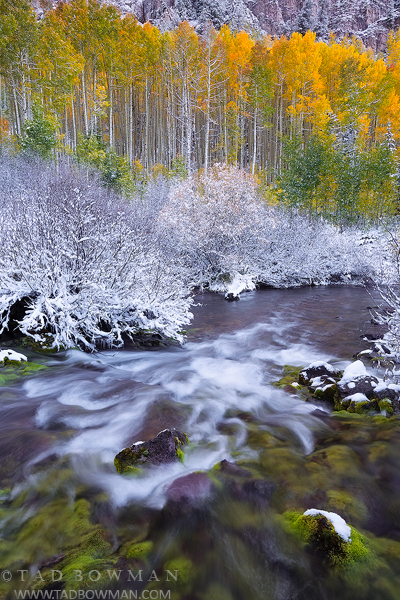 This image titled “Blending Seasons” was an image I visualized prior to a winter storm coming in. I was hoping that I might have a layering effect of snow and colors. When I hiked to this location, I was pleasantly surprised to see what I had hoped for. As mentioned above, the colors weren’t as widespread and grandiose as recent years. However, in the San Juan mountains, the scrub oak was incredible. One of the best years for scrub oak I had seen in awhile. I spotted this image driving around and did my best to capture the multitude of colors on the hillside. 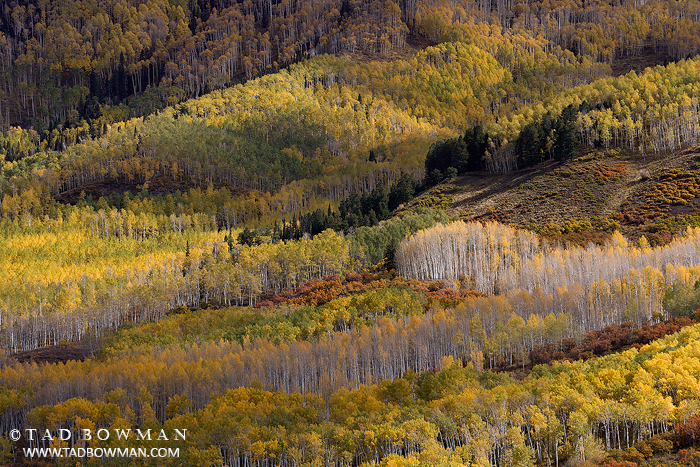 This last image was one of the few aspen strands I found that were healthy and colorful while I was out. This photograph depicts late afternoon light with clouds that are partially blocking the sun casting shadows on the scene. 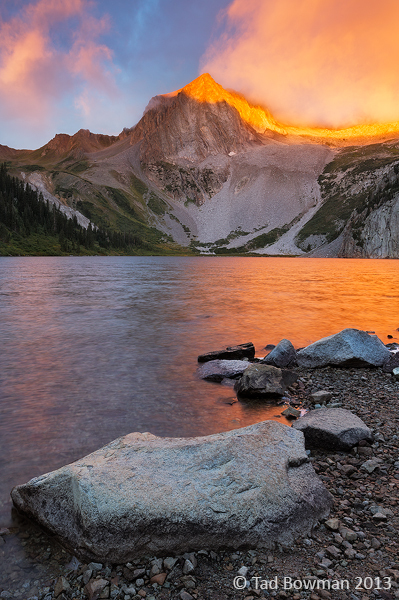 The mountain in the background is East Beckwith peak located outside of Crested Butte. Posted in Colorado, United States and tagged Aspen, Aspen Tree, aspen tree image, aspen tree images, aspen tree photos, Aspen Trees, autmnal, autumn, Colorado, Colorado Landscape Gallery, Colorado Mountain Photography, Colorado Mountain photos, Colorado Mountain pictures, colorado mountains, East Beckwith, fall, fall colors, fall foliage, gold, landscape, Mount Sopris, pictures, scenic, scrub oak, snow, snowy on November 15, 2013 December 5, 2017 by Tad Bowman. For some reason this Colorado wildflower season was very similar to last year – both were challenging to find profuse flowers in the mountains. I found some clumps here and there, but nothing like I had seen in years past. I came away with a few photos of some flowers and then some other scenic photos that I enjoyed photographing in the absence of many flowers. 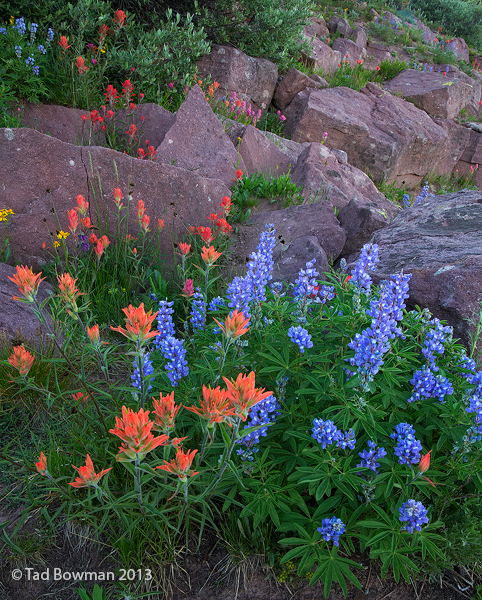 This photograph depicts a combination of Indian Paintbrush (different colors) and Lupines interspersed with boulders in the White River National Forest. The following photo was a surreal sight. Standing high up in the La Plata Mountains and have clouds swirl around you was amazing. At first I was a little unnerved by the weather thinking it could lightning at any moment. 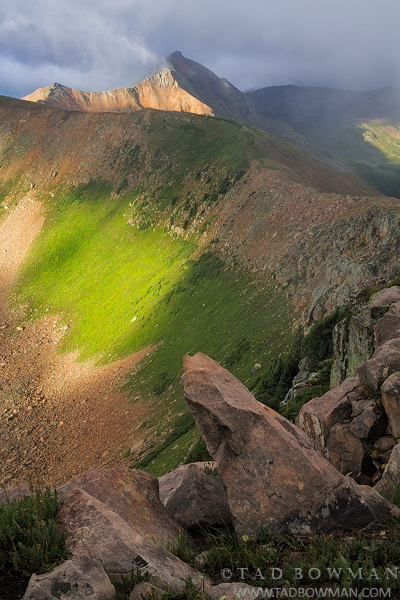 Then the sun broke through the clouds for a brief minute illuminating Diorite Peak. This last image is also one of my favorites. I had been interested in photographing Snowmass Peak for several years but never made my way there. This year, I decided that I would do it. Not only was the area around the lake fantastic, but the hike was one of the most enjoyable hikes I had ever been on. Plenty of alpine meadows and majestic mountains. Posted in Colorado, United States and tagged Colorado, Colorado Landscape Gallery, Colorado Mountain Photography, Colorado Mountain pictures, colorado mountains, colorado wildflowers, Diorite Peak, flower, flowers, indian panitbrush, mountain, mountains, photo, photos, picture, pictures, Snowmass Peak, tad bowman, waterfall, waterfalls, wildflower, wildflowers on November 13, 2013 December 5, 2017 by Tad Bowman. I took a quick weekend trip up in the Colorado Rocky Mountains. I didn’t have any dramatic light. 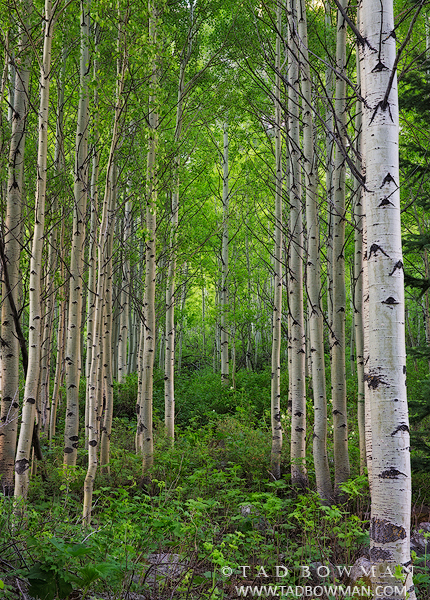 However, I was content photographing aspen trees covered with vibrant green foliage. 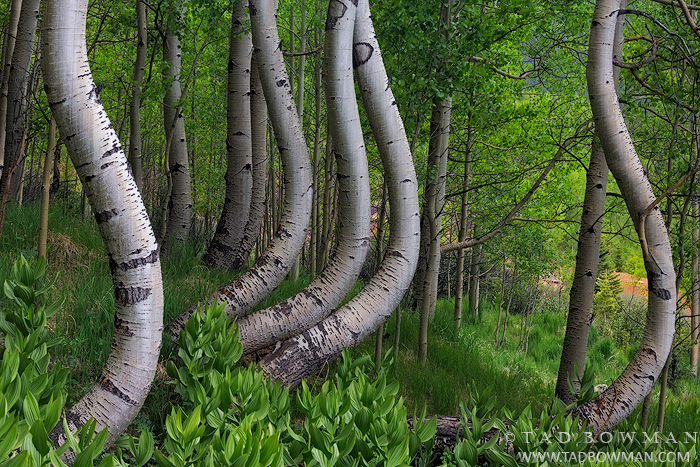 This shot is a sprint rendition of my Fall Twisted Aspens that was photographed in 2012. Another photograph I came away with I just kind of came to me while sitting on a rock watching the sun paint light on the mountains. I saw these aspen trees and was really drawn to the pathway (tunnel) they created. The trees on the side seemed to all converge on one tree in the middle. 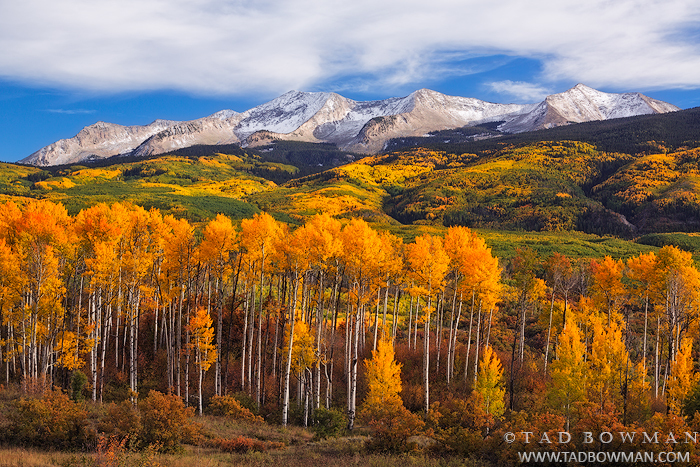 Posted in Colorado and tagged Aspen, Aspen Tree, aspen tree image, aspen tree images, Aspen Trees, Aspens, Colorado, Colorado Mountain Photography, Colorado Mountain photos, Colorado Mountain pictures, green, spring, vibrant on June 27, 2013 December 5, 2017 by Tad Bowman. Another year has rolled around and I’ve just finished processing photos from my annual spring Desert Southwest trip. Most years, I find myself visiting Utah and Arizona twice a year. Once in the winter and another time in the spring. This year I decided to start with a backpacking trip into Coyote Gulch in Grand Staircase-Escalante National Monument. I started off in the morning heading towards crack in the wall anxious to see the stream and the green trees that surround it. 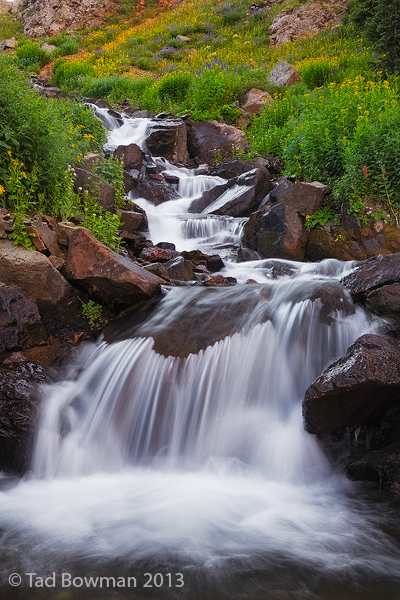 I descended into the canyon and waded up stream until I found a waterfall that I wanted to photograph. I pulled out my tripod extended the legs. Next I took out my camera and started to mount it on my tripod when I realized that I forgot my tripod mount for the camera. I had no way to steady the camera on the tripod to eliminate camera shake. I decided that there was no way I could stay. It would irritate me too much not being able to photograph. Back to the car I went. Another image from the area that I really liked really reminded me of some kind of reptile scales especially with the foreground that reminded me of a foot along with interesting splashes of yellow. 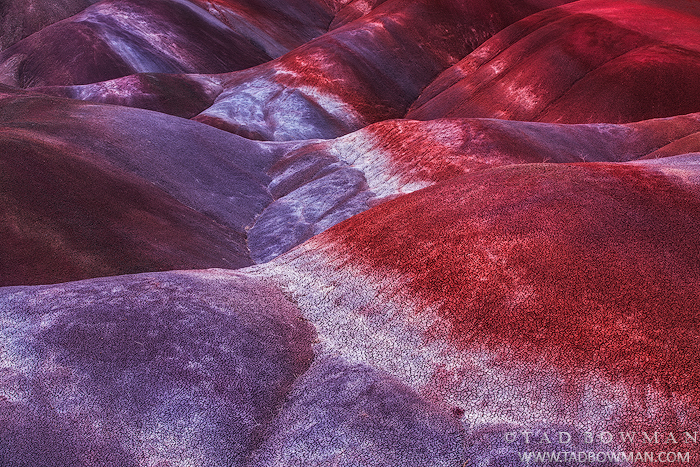 This next image was taken near the Vermillion Cliffs area of Arizona. 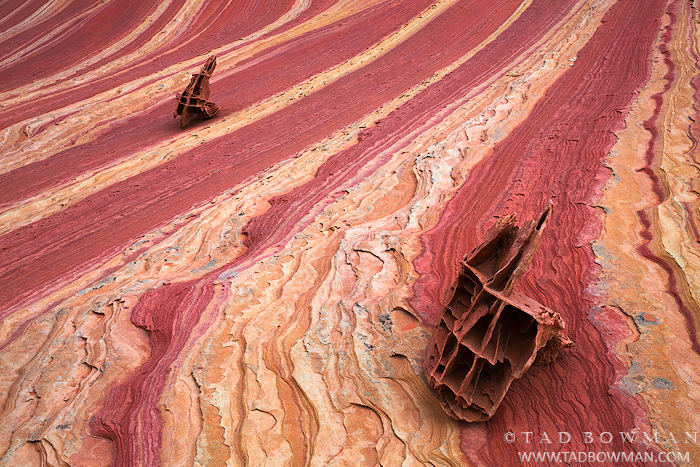 The structures of the rocks resemble lattice riding red waves down the sandstone. They look so fragile and you can’t help but wonder how they survived so long. I’ve attempted this last photo multiple times without success. It’s one of my favorite locations and I’ve been told that the Navajo consider this canyon to be their Grand Canyon. In this particular photo, I was perched on a ledge as a thunderstorm came through. The winds were very strong and I was getting drenched as I held onto a rock and my tripod to prevent the both of us from going over. 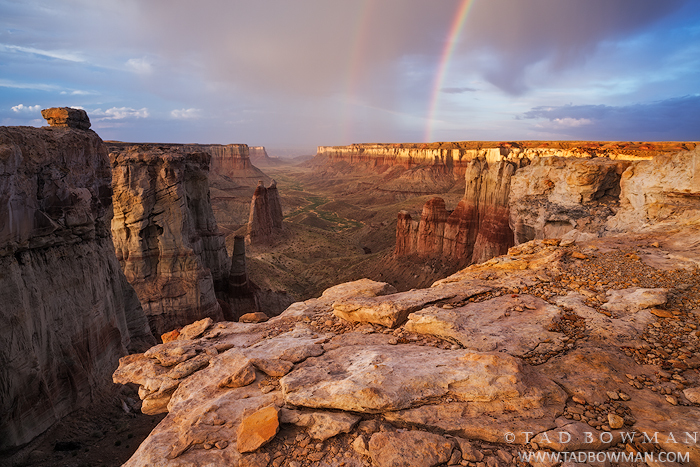 The storm passed quickly and the sun came out to treat me to two rainbows with warm light of the setting sun. These are a sampling of photos from the trip. 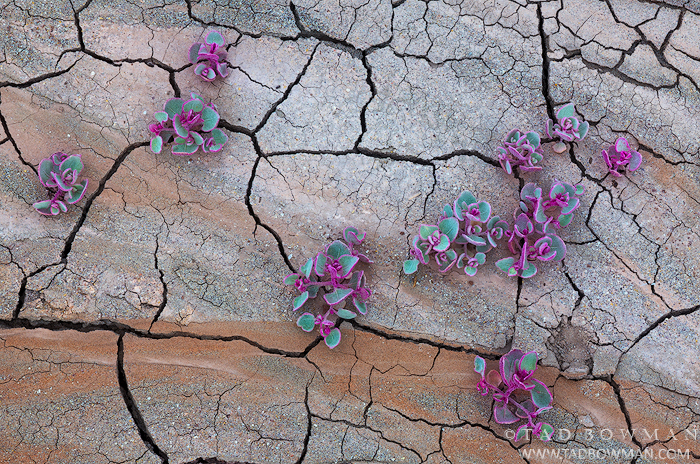 More are located in the New Photos section and the Desert Southwest section of my website. Thanks for looking! 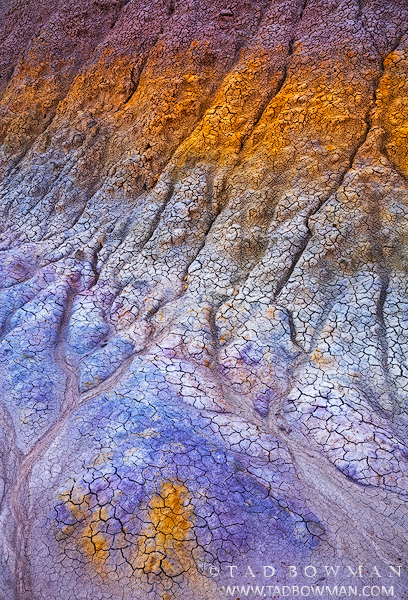 Posted in Desert Southwest and tagged arizona, bentonite hills, Colorado Plateau, coyote gulch, Desert, images, photography, photos, pictures, Southwest, spring, utah on June 17, 2013 December 21, 2017 by Tad Bowman. 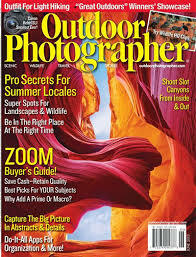 Posted in Publications and tagged outdoor photographer, publications on June 2, 2013 June 25, 2013 by Tad Bowman. I am now showing my work at the Denver Photo Art Gallery. The gallery is owned by John Fielder and he shares space with other artists. If you are in town or visit, please take some time to visit the Denver Photo Art Gallery where you can see some of my work displayed. I am displaying a combination of work including Colorado Mountains, Grand Tetons, and Idaho photos. Posted in Gallery Showings and tagged art galleries, art gallery, Colorado Landscape Gallery, fine art, showing, tad bowman on March 22, 2013 December 5, 2017 by Tad Bowman.